From that day in March of 1967, many years had passed by... 49 years to be exact.. and we had received no news about the racing story of prototype n. 001. It won the first race at Fléron, Belgium and then it registered no other positive results. It fell off the radar screen entirely. In 1968, only one year later from that initial victory, with the evolution of the new T-33 cars on the immediate horizon, the prototype no. 001 had disappeared completely from the world's competition racing stage. The triumphal progression of new T-33 cars continued on for ten years with a string of newer, faster models until the last model, the 33 SC Turbo, in 1977, ended the glorious run of the 33 model. The 33 SC Turbo had a 3 liters engine with 12 cylinders, a turbokompressor KKK and 640 HP. T-33 Fléron 2.0 liter and 33 SC Turbo, in the end, shared only the same number “33" in their identity. The chassis 001 literally laid in a junk heap in the Autodelta courtyard among the other scraps remaining after the closure in Settimo Milanese of the Autodelta walled manufacturing facility in 1982. The racing department was transferred to Senago, where Euro Racing, the new racing department of Alfa Romeo, was not interested to the past glorious story. At that point, Ing. Carlo Chiti became extremely embittered to have been assigned, in a disgraceful manner, to roles much less and less important. 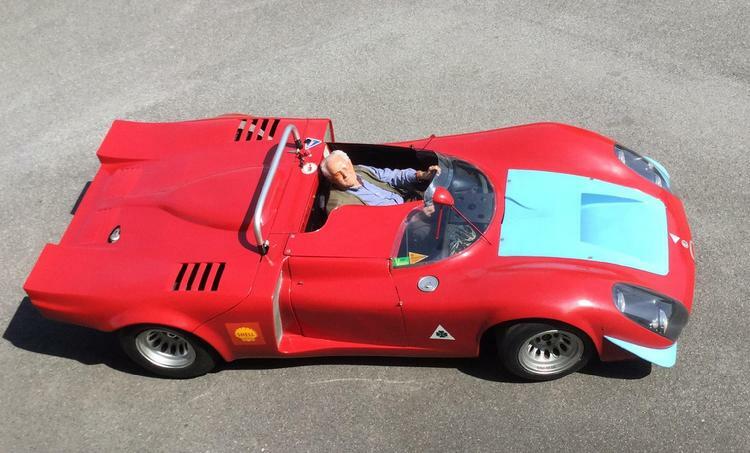 Along came Marco Cajani, an architect from Milan, a great fan of Alfa Romeo automobiles and of its racing history. He had the skill to find the first prototype of the 33 in 1986 within the confines of that junk heaped courtyard at # 7 Via Enrico Fermi in Settimo Milanese. Cajani is also a good driver and in his life has won many titles in the European Challenge for Historic Touring Cars and in other important races. Carefully and skillfully... employing his best diplomatic demeanor, Cajani eventually succeeded in buying the car. The chassis was mostly complete and in one piece... there was also its engine, gearbox, suspension pieces and many other parts among the scraps of what many years ago were the winning racing cars of Autodelta. No more dogs ran within the Autodelta courtyard, like they used to do when Ing. Chiti took it upon himself to personally collect stray dogs and cats on the streets of Milan and give them shelter, medical attention, food and another chance at life. No one would think today that... exactly in this place ...were built the cars that would have won everything on the race circuits of the world. Cajani, knowing the value of what he had found, spent many years looking for missing pieces that had become separated form the rubble pile, but at the end he succeeded to pick up all the miscellaneous components of the car # 001. A few parts of the body were lost, no one knows where, but Cajani asked Giovanni Giordanengo, very skilled at reconstructing pieces of oldtimers, to complete the work. In his workshop in Cuneo (Piedmont) he had already rebuilt the bodies of many beautiful oldtimers, working together with many car museums throughout the world. He was the master who was destined to give new life to the T-33 Fléron, the prototype chassis number 750.33.001! Following every original shape and curve of designer Scaglione and carefully forming the individual body panels of this beautiful car with old world wooden forms and tiny hammer techniques, Giordanengo for all his hard work eventually brought the T-33 Fleron back to life. Today the T-33 Fléron is preserved among the other beautiful cars of the Cajani collection... beautiful cars restored with love and passion to preserve the historical memory of these wonderful masterworks. Time to time the T-33 Fleron is returned to race tracks broadcasting the sound of its wonderful engine. Usually manufacturers of racing cars organize directly or through an “owner's fan club” an "Historic Register", where enthusiasts can learn the full story of every car produced in their factory. But, unfortunately this has not been the case with Ing. Chiti's Autodelta. 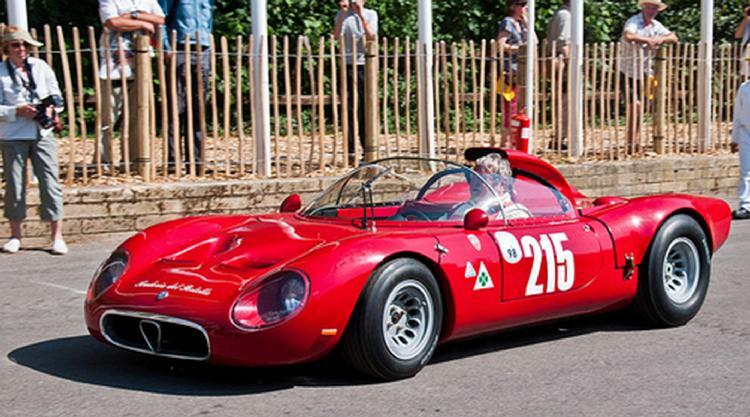 We here at "Autodelta Golden Years.com" have elected to construct a Historic Register ourselves...starting with, appropriately, the T-33 750.33.001 the famous Fleron Alfa Romeo. When the prestigious Tipo 33/2, partially designed and developed by Ing. Chiti and driven in period races by Aldo Bardelli, a racing driver from Pistoia in the 60's and 70's, this car has finally returned to Pistoia after almost thirty years. We feel strongly to retrace its history as far and as completely as possible. 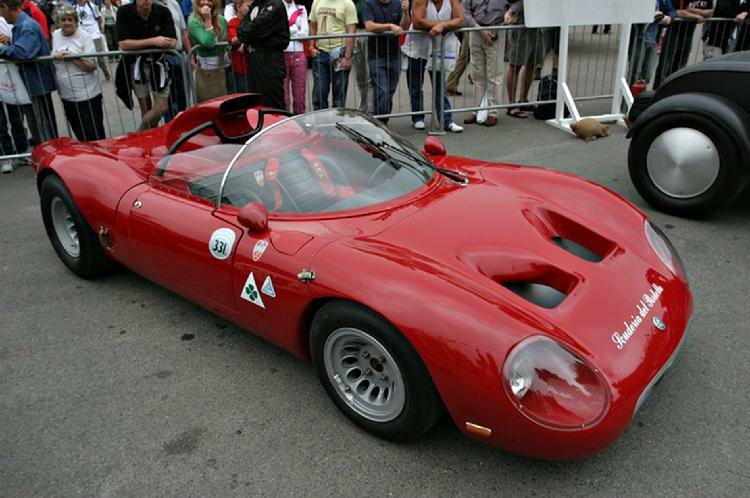 The Alfa Romeo Tipo 33, VIN 750.33.014, had its debut at the 1968 edition of 24 Hours of Daytona, driven by Casoni / Riscaldi... at the end of the race those drivers achieved 7th place overall. 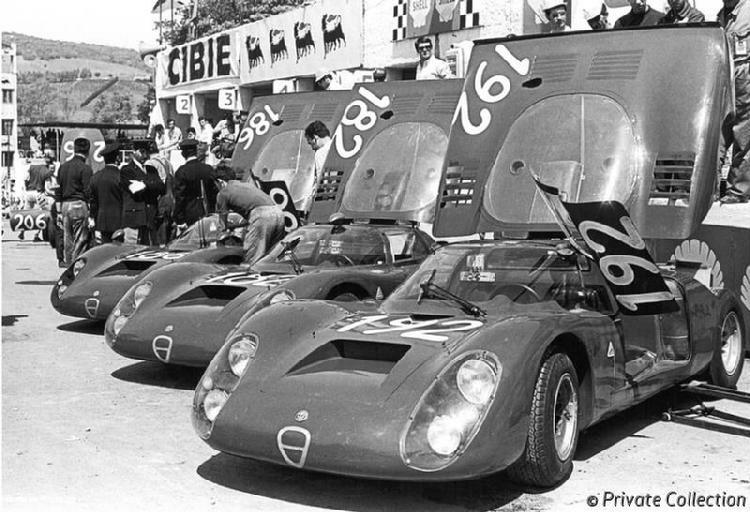 The same car was entered by Autodelta appeared at the Targa Florio in 1968, where the main antagonists was Team Porsche with many 907 / 2200cc 8 cylinder cars. Alfa Romeo took part in that race with three T-33/2 with the following racers: Baghetti / Biscardi, Galli / Giunti, Casoni / Bianchi (with the car 014) and one T-33 2.5 liter car driven by the team Vaccarella / Schutz. In the end, Porsche was the winner in a very exciting and hard fought race with the crew Eford / Maglioli; Giunti / Galli arriving in the second place with one T-33 (less than three minutes later) and the Casoni / Bianchi car ending the race the third place with the T-33/2 (Vin 014). The same car (Vin 014) was back on a race on the 25th of August 1968 at the Zeltweg G.P. (Austria), where Autodelta intrusted the car to the VDS Team owned by the Belgian Count Rudi Van Der Straeten; the pilot was Herr Trosch. We find again “our” T-33 (Vin 014) one year later at the Targa Florio driven by Casoni-Spartaco Dini (from Florence). The car was severely damaged during the practice, but Casoni found a drive with the Scuderia Tridentina that was racing with an Alfa Romeo T-33 too. 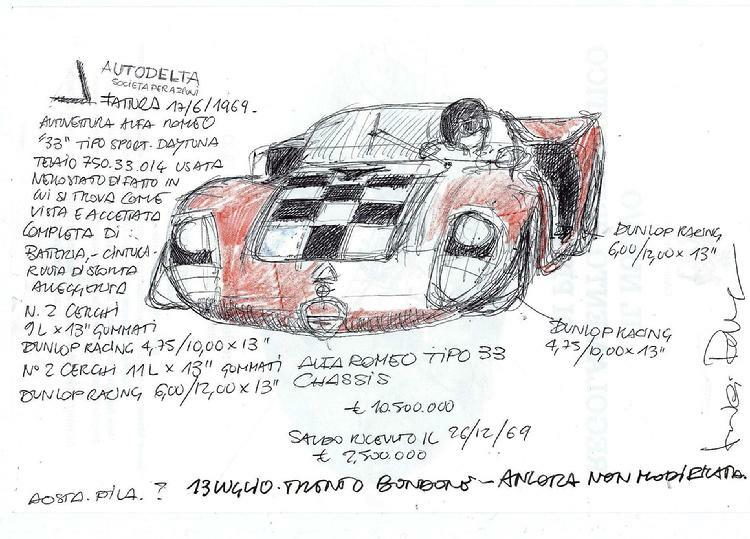 A formal document in Aldo Bardelli's personal library, records that the change of ownership of the “Autovettura AlfaRomeo 33 Tipo Sport Daytona telaio 750.33.014 usata, nello stato di fatto in cui si trova come vista e accettata completa di: batteria, cimtura, ruota di scorta, alleggerita (used car, as it is seen and accepted complete of: battery, belt, spare wheel, lightened) on the 17th of June 1969. And for this car begins a season running on uphill races and circuits in Italy and all over the world until 1971. During 1970 the car undergoes a particular change by Autodelta workshop. On 1969, before delivery to Bardelli, the orignal 33 Tipo Daytona had been lightened by removal of the roof and the side panels. On 1970 it underwent another slimming cure and became a “spider” to allow Bardelli to be more performing in the Prototypes of the 70's. Only three T-33/2 cars received this treatment directly from Autodelta. After three seasons, with many kilometers on his shoulders up and down along Italian roads, Aldo Bardelli ended his racing activity and sold the car to Giulio Dubbini from Padua. 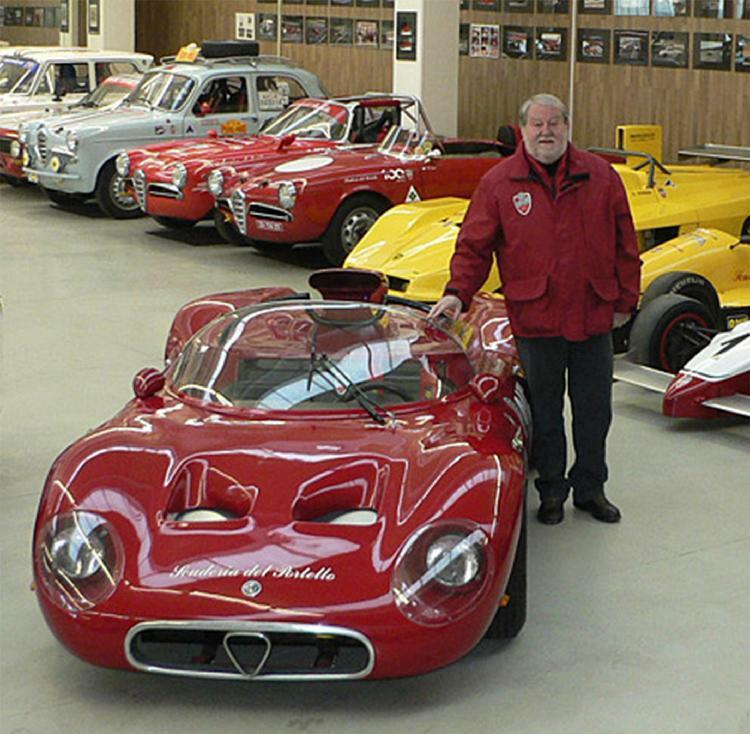 Some time after the car “Vin 014” left Italy and arrived in the Peter Kaus collection of sport cars. In 1987 Kaus with Hans Holger and Frenzel GmbH organized the “Rosso Bianco Museum” in an abandoned factory, with “our” T-33/2 in the collection for many years. Today the T-33/2 Vin 014, designed and developed by Ing. Chiti (born in Pistoia) and lead in the races by Aldo Bardelli, a racing driver from Pistoia, came back to Pistoia, with a ceremony at Villa di Groppoli (PT) on the 15th of May 2010. The car is now owned by Mr Alessandro Carrara. 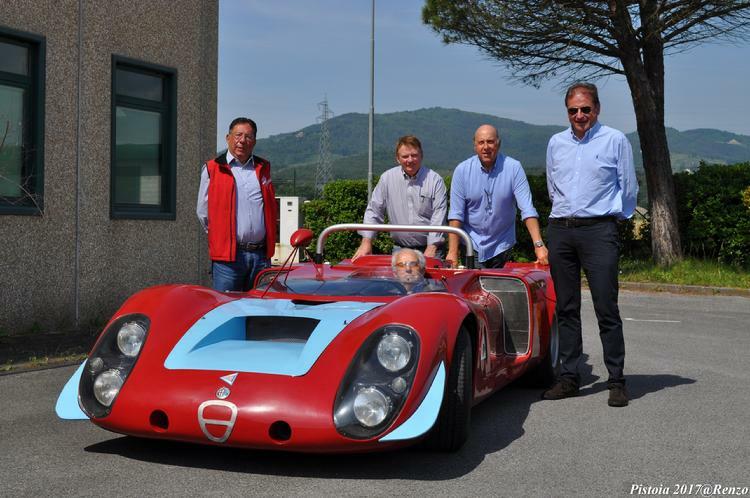 The driver is none other than the original Aldo Bardelli who was the champion with this T-33/2 Spider in the 1960's and 1970's, pictured along with website editors Renzo Carbonaro and Robert Little, vehicle owner Alessandro Carrara and website editor Ulrich Zensen. This photo opportunity was made possible through the courtesy of Mr. Carrara. 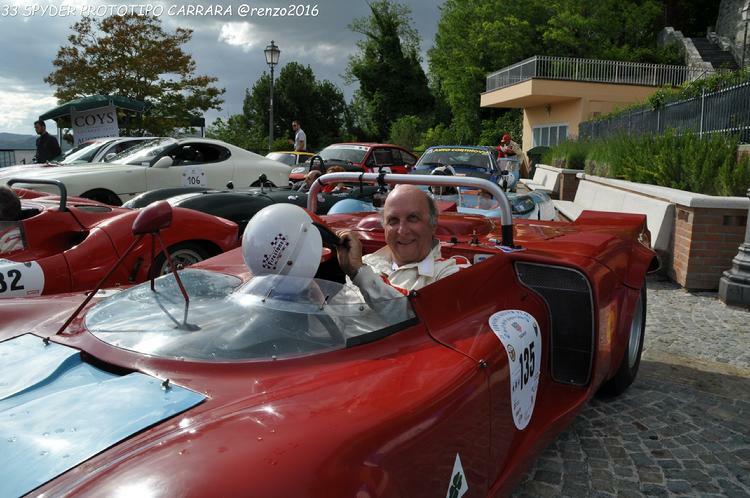 Mr. Aldo Bardelli with his original 750.33.014 Tipo T-33/2 now owned by Aldo Carrara. This car # 192 is T-33/2 750033-014 shown prior to the start of the 1968 Targa Florio. The drivers of this Autodelta car was the team of Bianchi / Casoni. The car was soon converted into a Spider version and sold to Aldo Bardelli who won an astounding number of races and hillclimbs with this car! This original drawing of the famous Aldo Bardelli T-33/2 created by and furnished to us through the generosity of Mr. Luigi Pulcini... the distinguished Editor in Chief of "Il Metato" magazine, a regional publication saluting the history and events of the wonderful Pistoia Region. To enjoy another of Mr. Pulcini's artistic accomplishments, please turn to the Stradale History section of "Autodelta Golden Years.com".